“The Bad Guys Share Information. The Good Guys Don’t.” Two Heavyweights In Information Security Join Forces To Combat Serious Information Security Dangers. EC-Council Foundation, the non-profit behind the annual Hacker Halted IT Security conference, has teamed up with ISSA Metro Atlanta, a local branch of one of the largest non-profit organizations for information security professionals and practitioners, to combine Hacker Halted and the 2014 ISSA Metro Atlanta annual conference. bring together the world’s best information security minds in order to defend against cybercriminals. It can be easy to forget the original point of information security conferences amidst the hyperbole, parties, and gimmicks: bring together the world’s best information security minds in order to defend against cybercriminals. EC-Council Foundation and ISSA Metro Atlanta are two heavyweights in the world of information security, and they have not lost sight of this principle. The two organizations have similar missions aimed at encouraging best practices in information security, but are taking those missions a step further by collocating their annual events in order to share resources and learning opportunities. EC-Council Foundation’s biggest annual event is Hacker Halted slated for October 16-17, 2014 in Atlanta, GA at the Georgia World Congress Center. ISSA Metro Atlanta’s annual event will now take place in the same venue on October 17, opening the opportunity for attendees of each organization to experience both conferences. Says Jay Bavisi, President of EC-Council Foundation, “Years ago, information sharing was my main motivation for putting on infosec conferences. What I saw was that cybercriminals were much better at sharing their hacks and techniques for stealing information than the good guys were at sharing their defense strategies.” Hacker Halted, now in its ninth year as an annual event, is a two day conference focusing on the latest trends in information security and is this year proud to be headlined by world famous Johnny Long, groundbreaking author of Google Hacking. 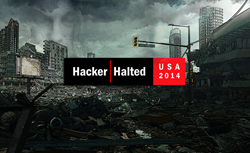 Hacker Halted is where the world’s leading white hat hackers come to network, trade tips and tricks, and learn from the best. Occurring before the two-day conference is Hacker Halted Academy, four days of intensive information security training with classes on Advanced Mobile Hacking, Certified Chief Information Security Officer, and Certified Ethical Hacker, among many others. Also collocated with the two IT security events is the Global CISO Forum, an invitation-only event with topics and speakers pertaining to the executive management aspects in information security. All ISSA Metro Atlanta members who qualify for an invitation are invited to join the Global CISO Forum for two days of keynotes, panels, networking, and a field trip to the secure operating center at the Georgia Tech Research Institute. EC-Council Foundation is a not-for-profit initiative by EC-Council to raise awareness of online safety issues for the global community while unifying global cyber defense. EC-Council Foundation’s mission is to unify global cyber defense by fostering collaboration and participation of online computer users to become advocates for safe on-line activities for youth and adults alike through education and training programs. Visit http://foundation.eccouncil.org/. The Information Systems Security Association (ISSA) is a not-for-profit, international organization of information security professionals and practitioners. It provides educational forums, publications, and peer interaction opportunities that enhance the knowledge, skill, and professional growth of its members. The primary goal of the ISSA is to promote management practices that will ensure the confidentiality, integrity, and availability of information resources. The ISSA facilitates interaction and education to create a more successful environment for global information systems security and for the professionals involved. Members include practitioners at all levels of the security field in a broad range of industries such as communications, education, healthcare, manufacturing, financial, and government.